As a theme activity of Dehong branch venue attached to the 6th Yunnan Academic Year of Social Science and 2012 Academic Month of Social Science, “2012 China·Dehong Seminar on Economic Development Around Indian Ocean" opened on December 13 in Mangshi. Fan Jianhua, chairman of Yunnan Federation of Social Science, Wang Wencheng, vice president of Yunnan Academy of Social Science, and experts as well as professors from different colleges, associations and research institutes attended the opening ceremony. It’s learnt that the seminar, based on national strategy of Western Development and practical situations of Dehong, is intended to provide consultations, suggestions, and solutions for the headway of gateway establishment and Ruili Pilot Zone, boosting the scientific, harmonious and leap-forward development of Dehong. 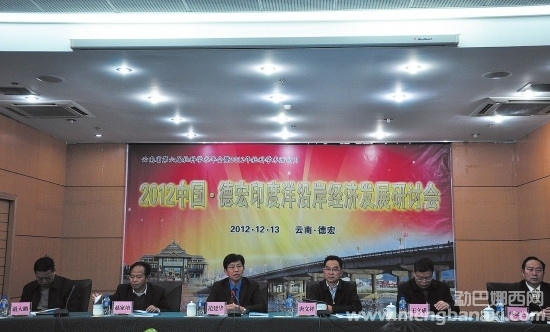 Tang Wenxiang expressed at the opening ceremony that gateway golden port is a regional concept. Making Dehong a pilot zone of gateway establishment indicates the importance of Ruili Pilot Zone. Now, Dehong has been on the starting point of a new history and the curtain for a new round of rapid development has been drawn. Regarding the establishment of Ruili Pilot Zone as a breakthrough, Dehong will try its best to be efficient and integrated in the gateway establishment, in a bid to realize maximum profits and leap-forward development of society and economy. The annual seminar for social science circles, hosted by Yunnan Publicity Department and Yunnan Federation of Social Science, has been held for five consecutive years since 2007. During the branch seminar in Mangshi this year, Wen Fude, head of Research Institute of Southern Asia attached to Sichuan University was invited to give a special lecture on the gateway establishment in Yunnan and economic development around Indian Ocean, which will bring a broader academic sight for the seminar.